← Video – I Was Hungry, And You Nursed Me? From Pastor Foley–I understand the concerns expressed by Multiply Justice, Luke Moon, and Shane Claiborne over new laws banning or severely restricting or regulating public feeding of the homeless. I really do. As a former president of one of the largest homeless service providers in the world, I know a thing or two about the challenges ministries to homeless men and women face in the public sphere. That said, I part company with my brothers in describing the growing body of restrictions as a “war on generosity” or as “barriers to compassion.” To the contrary, I see the new regulations as an opportunity for the church to reflect on what the Bible’s call to share bread with the poor really means. Let me hasten to note that I do not agree with the rationale given by public officials as to why such restrictions are necessary. I am not arguing, for example, in favor of banning public feeding out of a concern for the sodium and fat intake of poor people. There’s something very important about Matthew 25:37 and it can only be found in the Greek. It has to do with the word that is typically translated only as “feed”; the Greek word ethrepsamen. It means to nourish, support, nurture, and nurse like a mother breastfeeding an infant. One only can be said to feed the poor when one holds them to one’s own chest and shares the substance of one’s own life with them as the token-and-pledge provision of host Jesus. So a fast is not merely a transfer of food but of deep love and care. The food is always the glorious least of what is offered. I anticipate that my brothers whose posts I noted above would all nod assiduously and say, “Yes, of course, obviously–that’s exactly the kind of meal we have in mind.” But if so, we must ask ourselves: When we want to have a meal exhibiting that kind of love and care with family members and honored guests, what does that look like and where do we have it? And that’s where the rest of Matthew 25 provides crucial context. In the passage, Jesus is not identifying sharing your bread, providing drink, opening your home, and providing clothing as separate “projects” or “ministry outreaches,” e.g., meal at the park, canned food collection, homeless shelter building, coats for kids drive. Instead, taken together–as he intends–what emerges is a picture of ordinary Christians using their homes and their daily meals and the best clothes on their backs–not their neighborhood parks and cans of convenience store chili–to engage strangers and outcasts as family; that is, a lifestyle of spiritual and material engagement. It is not radical to have a lifestyle of serving meals at the park. It is radical to see one’s own possessions as not one’s own possessions but rather as gifts from the good and loving God to be freely shared with others. I wrote previously about how during my time at the Los Angeles Mission we took the big Thanksgiving and Christmas “feedings” off the street and into the single room occupancy hotels of Skid Row, going from plastic utensils, tables covered with butcher paper, and volunteers smiling as they poured cups of ice tea for the “grateful homeless” to meals where everyone prepared, served, and ate the meal together, where it became increasingly difficult to tell who was giving and who was receiving, because everyone was doing both. “Feeding the homeless” is not radical. Sharing Your Bread in the park is not radical. 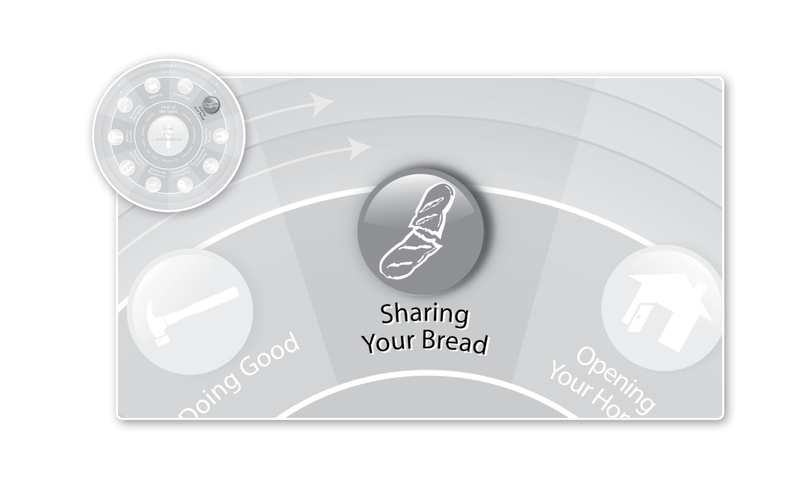 Enabling homeless men and women to share their bread around your dinner table–that is radical. That, in fact, is an interesting aspect of the story of Jesus’ multiplication of fish and loaves that is overlooked: Jesus never disdains the poor by treating them as mere recipients; they are his co-creators. The feast begins, after all, with a boy offering his fish and loaves. The poor are always providing for the rich in the Bible, not the other way around. It’s one of God’s hallmarks. And Jesus was not criticized for caring for the poor. Most religions do that. Instead, he was criticized for how he redefined the dinner table. Banning public meals would not have set Jesus back at all; after all, once Jesus announced that he was the main course, everyone who was left over could have fit into the Upper Room (and, in fact, did). Jesus’ complaint to the goats was not “I never got a sack lunch from you at the park” but rather “I never sat at your dinner table.” No law currently on the books prevents that injustice from being remedied. Want to hear today’s blog message in hip-hop sermon form? Check out the work of DJ Sound Doctrine, aka my son Trevor Foley, as he lays this message down on the ones and twos over on Soundcloud. This entry was posted in Sharing Your Bread, Uncategorized and tagged eating with the homeless, Homeless, public policy. Bookmark the permalink. Eric, your analysis of both the text and the ministry need are spot on, brother. I can’t speak for the others, but I can speak for Multiply Justice and we highly value the kind of “ethrepsamen” ministry you describe. I don’t think your observation negates Mr. Moon’s point about governmental motives in passing the regulations, nor do I think it invalidates large-group feedings as a necessity when the need is so great and churches are not properly engaged on the needed scale in loving and mentoring the poor into abundant life. We don’t see an either/or choice here, but if a congregation believes passing out bologna sandwiches under a bridge is the vision of Matthew 25, they are mistaken. We couldn’t agree more about the intimate relationships and the “not mine but His” perspective on possessions and ministry. We believe we are not doing justice until we get hands-on, loving people in need up close and personal. We are delighted when Christians who are doing nothing begin doing something — anything — but the leader’s goal should be drawing those Christians in toward the kind of intimate personal relationships with others that provide the opportunity for lives to be transformed. Would you give permission for us to excerpt your linked article on our site? Great to hear from you, Mark, and great to engage in this dialogue. Yes, please feel free to exerpt the linked article. I appreciate your formulation of a goal for leaders at the end of your comment–“drawing those Christians in toward the kind of intimate personal relationships with others that provide the opportunity for lives to be transformed.” I am hopeful to see more and more nonprofits, missions, and homeless shelters to set an example for Christians and churches of the kind of ethrepsamen care about which Jesus speaks. I look forward to co-laboring with you in this regard! Are you and your mom coming down for the Colorado Springs VOM conference, JT? Probably too far, huh?